So many happy things in the red cabinet. The top shelf has 6 juice glasses that have cherries on them. Besides those are the Fire King Polka Dot Bowls. The bottom is a mixing bowl, sitting on top is a grease jar with the lid. 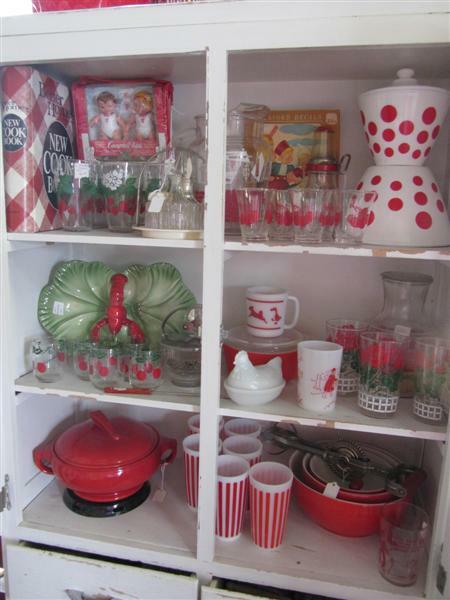 The middle shelf has a super cool Brad Keeler Lobster dish and a nice red Pyrex left-over dish. The bottom shelf has a Hall “sundial” pattern covered casserole dish and there are some Hazel Atlas Striped tumblers too.